No institution in the land is equal to this. The Hagey Remedies are endorsed by thousands of the best people in Texas and other States, and multitudes testify to its efficacy. However frail the patient may be when he enters the institute, he leaves perfectly cured of the habit, with pure blood, strong nerves and restored to health. No disagreeable or bad effects have ever resulted from the treatment. It is absolutely harmless. A cure is guaranteed and accommodation good. From the Souvenir Guide of Dallas (Dallas: D. M. Anderson Directory Co., 1894). 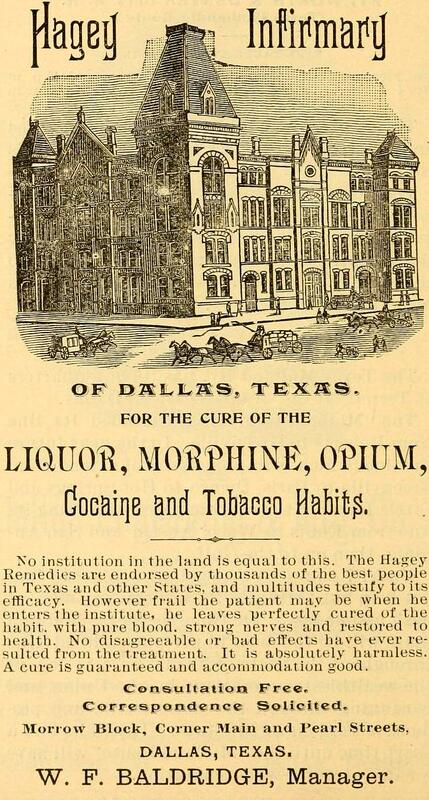 The Hagey Infirmary was at 516 Main (now the 2100 block of Main, at Pearl), from about 1893 to 1894 (possibly 1895).